As you may have noticed on your latest road trip, American roads are busier than ever. With more than 200 million licensed drivers in the country, there’s a good chance you’ll eventually find yourself in a collision with one of them. That’s the bad news; the good news is that in nearly three decades of helping accident victims, Taylor King has learned quite a bit about how you can minimize damages and maximize your recovery after an unfortunate accident. You’ve already read much of his advice in the first two installments of our latest blog series: Car Wreck 101: What To Do After an Accident and Car Wreck 102: Seeking Medical Care After a Car Wreck. Today, we’re taking a different approach. Thanks to the wisdom of many people who’ve been in your shoes, we’ve compiled a “Don’t” List – five mistakes to avoid after being involved in a car wreck. DON’T keep driving or leave the scene of the accident without talking to the other driver. Even if the accident is merely a fender-bender, no one was hurt, or the other driver was at fault, Arkansas law requires you to stay at the scene. Failure to do so could result in criminal charges! DON’T agree to sort things out with the other driver without reporting the wreck to the police. 1 in 6 Arkansas drivers doesn’t have insurance. By agreeing not to report the accident to police or file a claim with your own insurance, you make yourself vulnerable to an uninsured, underinsured, or simply dishonest driver. An official police report will be very helpful when you file an insurance claim. If the police choose not to come to the scene, you’ll need to file your own report. DON’T leave without getting detailed information. There’s a lot of information you need to get from the other driver: name, address, phone number, license plate number, driver’s license number, insurance company, and the name of the car’s owner. It’s not impossible to get that information later on, but it is much more complicated! Your personal injury lawyer can get to work on your case much more quickly if you can give them that information at the beginning. Consider taking photos of license plates and insurance cards to simplify the process. DON’T admit fault to the other driver, police officers, or witnesses. Especially in the South, where we pride ourselves on being polite, your first instinct may be to apologize to the people in the other car. In some cases, though, this may be considered an admission of guilt. Stick to stating the facts of the accident, without suggesting which driver is at fault. Likewise, statements to your insurance adjuster may be used to negatively impact your case and result in a lower settlement offer for your injuries. When you speak with your insurance company, tell them about your vehicle and property damage, but don’t share details about your accident or injuries. DON’T refuse medical care. Some common car accident injuries, like broken bones, are immediately apparent. But many other injuries, including head and spine issues that could take months of treatment to resolve, may not fully develop until several days later. That’s why it’s always a good idea to see your doctor after a collision. 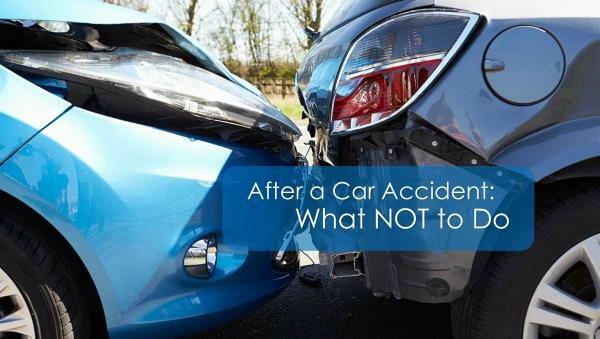 It’s also important not to make statements like “I feel fine” or “I’m not hurt” at the accident scene; those statements could later be used against you by an insurance adjuster looking for a reason to deny your claim. Finally, don’t forget to be patient. It takes time to resolve a personal injury case and negotiate a settlement! Were you injured in a car accident? Do you have questions or concerns? The Taylor King Law firm represents thousands of Arkansans in personal injury cases. We may be able to help you. Contact us for a Free Consultation at 1-800-CAR WRECK (227-9732), fill out our quick and easy Case Evaluation Form online if you’d like for us to call you. We’ll be happy to speak with you about your injuries and discuss your legal options. At Taylor King Law we’re on your side, by your side.